Patrick Bond Professor of political economy at the University of the Witwatersrand School of Governance in Johannesburg. The weeks following anunderwhelming Brazil-Russia-India-China-South Africa (BRICS) mid-September summit in Goa and the United States presidential election in November have unveiled ever-widening contradictions. Thanks to blatant corruption, presidential delegitimation has reached unprecedented levels in both Brazil and South Africa; while ruling-party religious degeneracy in India also included an extraordinary bout of local currency mismanagement; and sudden new foreign-policy divergences may wreak havoc in China and Russia. The BRICS bloc’s relations could well destabilize to the breaking point. BRICS as anti-imperialism – or sub-imperialism? The BRICS – Brazil, Russia, India, China and South Africa – gradually took their present form throughout the decade of 2001-10, after Jim O’Neill of Goldman Sachs Asset Management initially conceived the acronym BRIC as the next high-growth collection of economies. At Beijing’s behest, South Africa was added in 2010 for geopolitical balance. Starting in 2008, the global financial crisis fostered a discussion on whether core countries were losing power in the world order, with the expectation that China and other leading ‘emerging economies’ would challenge dominant countries especially in multilateral institutions. The crisis immediately consolidated a G20 which included BRICS heads of state along with the Bretton Woods Institutions. The purpose was to negotiate for a coordinated world response to financial instability, based upon Keynesian principles of state deficit financing, loose monetary policy and lender-of-last-resort coordination. The tyranny of global monopoly-finance capital can be seen in part as monetary geopolitics backed by military power. Through investment schemes, it directly appropriates the production gains made by the physical and resource economies of developing countries. At the same time, it engages in financial speculation by buying long and selling short in capital markets. The end result is the plundering of social wealth. China is not immune to this tyranny. This article analyzes the causes and effects of China’s financial crises, which are in large part the fallout of crises occurring outside China. Crucial here is uncovering how financial capital–both domestic and foreign–has become alienated from the physical economy and “de-localized” in its pursuit of profits. Funded at $100 billion each, the BRICS Contingent Reserve Arrangement (CRA) and New Development Bank (NDB) represent ‘sub-imperial’ finance, insofar as, by all indications, they fit into – instead of providing alternatives to – the prevailing world systems of sovereign debt and project credits. Balance of payments constraints for BRICS members will not be relieved by the CRA, which requires an IMF intervention after just 30% of the quota is borrowed. In this context the NDB would appear close to the Bretton Woods Institution model, promoting frenetic extractivist calculations based on US dollar financing and hence more pressure to export. South Africa’s role in global economy and geopolitics was, during the apartheid era, explicitly subimperialist, as the West’s ‘deputy sheriff’ in a tough neighbourhood. But with democracy in 1994, there arose a debate surrounding the difference between the liberation government’s (leftist) foreign policy rhetoric and its practice. Defining the subimperial standpoint at this stage is important in because of the extreme economic, social and environmental contradictions that have worsened within South Africa, for which antiimperialist rhetoric is sometimes a salve. However, the explicit strategies for global engagement chosen by Pretoria, including joining the Brazil-Russia-India-China alliance in early 2012, have not proven effective in reforming world power relations. The degree to which the BRICS have recently accommodated imperialism – especially in matters related to economic and ecological crises – suggests that critics should more forcefully confront the general problem of subimperial relegitimation of neoliberalism. That problem requires a theory of subimperialism sufficiently robust to cut through the domestic and foreign policy claims made by BRICS regimes, of which South Africa’s are amongst the most compelling given the ruling elite’s ubiquitous ‘talk left, walk right’ tendency and the extremely high levels of social struggles against injustice that result. A new ‘seat at the world table’ is demanded by major emerging market powers, especially the Brazil-Russia-India-China-South Africa (BRICS) bloc. The idea of establishing both a $50 billion BRICS Bank and a $100 billion Contingent Reserve Arrangement was articulated and endorsed at the March 2012 New Delhi and 2013 Durban summits of BRICS leaders, as well as at September 2013 G20 meeting in St Petersburg. At the latter, BRICS finance ministers expressed dissatisfaction about the International Monetary Fund’s governance, notwithstanding having collectively spent $75 billion in the IMF’s recapitalization the year before. Yet flaws in the global financial architecture remain vividly apparent and another world crisis is looming. The BRICS strategy – especially in relation to the expedited extraction of Africa’s minerals, petroleum, gas and cash crops – raises questions about how different their pro-corporate economic growth model is from the West’s, and whether their role in world capitalism is limited to assimilation, not alternative development finance. South Africa’s role in global economy and geopolitics was, during the apartheid era, explicitly subimperialist, as the West’s ‘deputy sheriff’ in a tough neighbourhood. But with democracy in 1994, there arose a debate surrounding the difference between the liberation government’s (leftist) foreign policy rhetoric and its practice. Defining the subimperial standpoint at this stage is important in no small part because of the extreme economic, social and environmental contradictions that have worsen within South Africa, for which anti-imperialist rhetoric is sometimes a salve. However, the explicit strategies for global engagement chosen by Pretoria, including joining the Brazil-Russia-India-China alliance in early 2012, have not proven effective in reforming world power relations. The degree to which the BRICS have recently accommodated imperialism – especially in matters related to economic and ecological crises – suggests that critics should more forcefully confront the general problem of subimperial relegitimation of neoliberalism, e.g. through a BRICS Development Bank now emerging. That problem requires a theory of subimperialism sufficiently robust to cut through the domestic and foreign policy claims made by BRICS regimes, of which South Africa’s are amongst the most compelling given the ruling elite’s ubiquitous ‘talk left, walk right’ tendency and the extremely high levels of social struggles against injustice that result. As they meet in Durban on March 26-27, leaders of the BRICS countries – Brazil, Russia, India, China and South Africa – must own up: they have been emitting prolific levels of greenhouse gases, far higher than the US or the EU in absolute terms and as a ratio of GDP (though less per person). How they address this crisis could make the difference between life and death for hundreds of millions of people this century. South Africa’s example is not encouraging. First, the Pretoria national government and its Eskom parastatal electricity generator have recently increased South Africa’s already extremely high emissions levels, on behalf of the country’s ‘Minerals-Energy Complex’. This problem is well known in part because of the failed civil society campaigns against the world’s third and fourth largest coal-fired power plants (Eskom’s Medupi and Kusile), whose financing in 2010 included the largest-ever World Bank project loan and whose subcontractor includes the ruling party’s investment arm in a blatant multi-billion rand conflict of interest. Since 1990, when the Cold War ended, formidable changes have beset African political economy. With the USSR becoming an initially impoverished Russia during the 1990s, the decline of Western overseas development aid reflected new power balances. The liberation of South Africa from apartheid in 1994 portended a more aggressive economic role – which has ebbed and flowed, with Johannesburg firms still the largest source of FDI in Africa – as well as political leadership culminating first in the New Partnership for Africa’s Development in 2001 and then in the African Union chair from 2012-16. The rise of Chinese parastatal investment and its uneven flow across Africa meant a rise in GDP – apparently justifying $200 billion in new Sub-Saharan African foreign indebtedness from 2006-16 (a 50 percent increase, mostly to China). But from 2011, the crash in commodity prices that signified the exhaustion of Chinese Keynesian infrastructure expansion left African materials exporters with enormous economic problems. Indeed, BRICS countries’ role in world trade apparently amplified economic and political contradictions associated with overproduction and global governance failure, especially in the World Trade Organisation when in December 2015, the Nairobi summit had devastating implications for food sovereignty in Africa as well as in the BRICS themselves. International Monetary Fund vote restructuring – also codified in December 2015 – featured four BRICS countries’ increases (led by China with 35 percent) but also dramatic setbacks for Nigeria (-41 percent) and South Africa (-21 percent) as well as smaller economies which were not as capable in supporting IMF recapitalisation. After 1994, a new era of post-apartheid foreign policy was to have begun, but a great many residual habits continued, including Pretoria’s self-interested geopolitical activity elsewhere in Africa (mainly on behalf of Johannesburg capital) and subservience to larger powers intent on the exploitation of the African continent via a South African ‘gateway’. The ‘subimperial’ stance was strengthened at the same time rhetoric was uttered about a new ‘seat at the world table’ for South Africa. As just the most recent example, the opportunity to establish a BRICS Bank was anticipated at the March 2013 Durban meeting of the Brazil-Russia-India-China-South Africa leadership, although it would only be at the September 2013 G20 meeting before details were to be released. The Durban summit advanced some countervailing institutional prospects, including monetary cooperation, a currency reserve and more Chinese bilateral lending for South African infrastructure, but debates continued about development finance. Precedents for the BRICS Bank are not only the Bretton Woods Institutions, which some BRICS finance ministers say they aim to avoid, but also the countries’ own development finance institutions. The BRICS seem to need a bank to assure expedited extraction of Africa’s minerals, petroleum, gas and cash crops, raising further questions about how different their pro-corporate economic growth model is from the West’s. The world is witnessing a political-economic passage on a global scale: from economic stagnation, amplified uneven development and financial volatility to worsening primitive accumulation (‘looting’) and socio-economic conflict. Considering Africa’s plight in this way suggests intellectual links between the political economy and security disciplines. Reforms proposed at the global level by elite bodies are apparently ineffectual and actions taken by elites in the name of conflict resolution often undermine peace because they reinforce the very dynamic of external looting. If these reforms continue to fail, it is to popular struggles that we should turn, especially in Africa where oppression is most extreme and global and local elites have the least credibility. For social movements, the objective of transforming power relations as the basis for ending conflict and underdevelopment requires engaging this new theoretical approach with acritique of capitalism. Conflict and peace theorists should also consider other innovations in political economy which address uneven and combined development, primitive accumulation and imperialism more broadly. The South African government is widely considered to play a progressive role in Africa and the world. Indeed, there was an expectation after the 2004 election that Pretoria would be part of a global backlash against neoliberalism. However, the radical rhetoric often emanating from Pretoria these days barely disguises its post-apartheid record of promoting of strategies which promote global integration. These include the New Partnership for Africa's Development (NEPAD); 'normalised' bilateral military relations with the Pentagon and geopolitical alliances with Washington across Africa; trade liberalisation; collaboration with Western financial power and facilitation of transnational capital in Africa; and opposition to demands for reparations for the West's apartheid-era profits. While some academic commentators have not yet grasped the essential nature of this policy direction, activists in the African Social Forum networks have periodically demanded the adoption of alternative strategies. Their vision is grounded in values of social justice and international solidarity; Pretoria's appears to be merely sub-imperialist. Contrary to orthodox belief the ongoing economic growth crisis in the West and the perpetual development crisis in Africa derives from the problematic of capitalism. The situation in Africa of high prices, inflation, massive unemployment and stunted growth is just taken as it is and borne painfully but stocially. But all this is due to the structure of capitalism which this paper seeks to explain. Marxian dynamic analysis, founded on the law of value and its role in the accumulation of capital, is the method of analysis employed. I explore results of such in terms of “unequal development” in the context of the asymmetry of the “centreperiphery” dual model. The discussion leads to an analysis of Walras's general equilibrium model and paradoxical observation that capitalism never experiences a general equilibrium. The “anti-law of value” theories of Walras, Sraffa, and Keynes are analysed as they seek to transfer economic value from the product of labour to the gains of capital. The critiques of Giovani Arrighi are also woven into the critical fabric. Contemporary liberal economists such as Joseph Stiglitz are noted for their lack of full comprehension of the dynamics of the contemporary form of capitalism which although seeking growth tends rather to stagnation in the social context of human alienation. In the end it is globalised finance capital that will prove to be the Archilles's heel of capitalism. It is at this point that the nations of the South should be prepared to delink from the capitalist as a precondition for genuine development. Necessarily this would apply to the nations of Africa. This paper engages critically with a set of broadly Marxian-based approaches to the relationship between global politics and processes of capital accumulation. This is then used to inform analysis of the dynamics underlying the multiple but inter-linked crises of food, environment (energy/climate/biodiversity), and finance. The first section assesses the work of Callinicos in his focus on renewed inter-imperialist rivalry, in which the USA is seen as wanting to secure access to, and control over, key resources to secure capital accumulation in intensifying competition with China and other capitalist powers. This approach is compared to the work of Panitch, Gindin, and Kiely in which they revive Kautsky’s notion of ultra-imperialism – here US hegemonic power is assumed to lead other capitalist states in the re-organisation of the global economy. It is argued that, ultimately, both approaches examine only the external relations between the separate but linked logics of capital and global politics. They also neglect the crucial role of the biophysical domain in defining key parameters surrounding capital accumulation. The ESRC (UK Economic and Social Research Council - ES/J018317/) funded CBAA project is exploring the new development cooperation engagements in agriculture across four African countries. The project is examining the politics of aid and investment policy in China and Brazil, exploring how understandings of agricultural development are translated in aid and investment projects. The project is being carried out as part of the Future Agricultures Consortium, connecting researchers from institutions in the UK and Africa with colleagues from China and Brazil. The research involves a mapping phase that is generating a geo-referenced database of Chinese and Brazilian agricultural development cooperation projects in Ethiopia, Ghana, Mozambique and Zimbabwe. In addition, in-depth case studies of a sample of these projects, are examining the ways in which experience and expertise from China and Brazil engage with the realities of African agriculture and the perspectives of African scientists and farmers. Comparative analysis across projects, countries and types of intervention are addressing the question of whether a “new paradigm” of development cooperation is emerging, and assessing the implications for the future of agricultural aid and investment policy. The CBAA Working Paper series publishes work in progress by CBAA team members. All papers are technical research papers which have been peer reviewed, and are available in open access format. Please consult the project web pages at http://www.future-agricultures.org/research/cbaa or be in touch with the author(s) for further information. Brazil, Russia, India and China (BRICs) have literally invaded the African continent, but not with arms. Instead, they have invaded Africa with money, goods, ideas, and drilling and mining equipment. Largely absent just a few years ago, the BRICs are now slowly but surely edging out Western countries in Africa in the areas of trade and investment, and to some degree development aid. India and China in particular, and to some extent Brazil, have increased their engagement in Africa in rather dramatic ways. The BRIC countries are now becoming major players in the continent, which has not only changed Africa’s traditional trade and investment relations but also created signiﬁcant opportunities and challenges for Africa’s economies. There is no doubt that Africa’s growth in 2011 will be inﬂuenced by its relationship with the BRICs. “Chindia” or Rivalry? Rising China, Rising India, and Contending Perspectives on India-China Relations Vincent Wei-cheng Wang Asian Perspective 35 (2011), 437–469 Whether and how India and China manage their futures as rising powers will critically shape international relations in the twenty-first century. These two countries demonstrate sharp contrasts in terms of their political systems, economic models, and social structures, despite their common aspirations for greater stature on the world stage. They have also maintained a very complex relationship that is weighed down by history but also offers promising opportunities in an era of globalization. While the implications for the rise of China have been widely debated, scant scholarly attention has been devoted to the rise of India or to how these two Asian great powers perceive each other’s ascendancy. This article examines the key factors influencing India-China relations, including territorial disputes, mutual threat perception and alignment patterns, and economic partnership and competition. It categorizes Indian elites’ perspectives on the rise of China in three paradigms: geopolitical, geoeconomic, and geocivilizational. It ends with a discussion of the possible scenarios of future India-China relations. KEYWORDS: India, China, Chindia, rise of China, rise of India, geopolitics, geoeconomics, geocivilizations, comprehensive national power. BRICS and Land Grabbing: Are South-South Relationships Any Different? This Article looks critically at South-South relationships and at the idea that they represent a better alternative to North-South initiatives. It provides empirical data against the rhetoric that Brics are the representatives and interpreters of the long-standing aspirations of the South in global affairs, and try to challenge the image of the five paladins of the wretched of the earth who act against the Western hegemony. In particular, utilizing the case of foreign direct investments in land as the frame of reference, it looks at whether the Brics are involved in the current green rush, and how they are utilizing municipal and international law in order to access foreign land and foster their own economic interests. The conclusion, which is an invitation to further investigation, suggests that it is time to abandon the idea that Brics represent a homogeneous and coherent block of countries, and that, even more importantly, the expansion of capital via the extraction of peripheral natural resources is not a Northern a prerogative. The main mining companies in the Democratic Republic of Congo (DRC) are listed in Canada, Australia and the US. These companies are being joined steadily by Chinese state-owned operators. Although Indian mining companies have a growing presence in the copper, cobalt, tin and tantalum sectors, their operations remain relatively small scale, and none can yet be considered a mining major. Indian mining companies have lacked access to capital from Western stock exchanges and Indian state-owned banks. Instead, they have grown their operations primarily by reinvesting their own profits. Future prospects for Indian mining companies appear broadly positive. This is particularly the case for Mining Mineral Resources, which is positioning itself to become the main producer and processor of ‘conflict-free’ tin and tantalum. The main risk to Indian mining companies is political. As with other mining companies operating in Katanga, they are vulnerable to a change in policy from Moïse Katumbi’s successor as governor of the province. Brazilian development banks have played an important role in bringing Brazil closer to Africa. Among these, BNDES deserves special mention: its incentives and disbursements to Sub-Saharan Africa have increased hugely over the past decade. Trade between Brazil and Africa climbed from around US$4 billion in 2000 to about US$20 billion in 2010 (table 5.1), with a steep rise from 2003. With Sub-Saharan Africa, it increased from US$2 billion to US$12 billion over the same period. This environment helped BNDES to launch measures to further trade between the two regions, making possible the use of Brazilian loans. The stimulus given to Brazilian exports has also been central to the expansion of trade. In 2008, incentives for Brazilian companies to export to Africa (under the Program Integration with Africa or Programa Integração com a África) led to the disbursement of R$477 million (approx. US$265 million), rising to R$649 million (approx. US$360.5 million) in 2009 (PDP 2010). This increase can be attributed to the strengthening of the Productive Development Policy (PDP), established in 2008 with the purpose of promoting the cycle of national economic expansion, even during international financial crises. South Africa’s membership of the brics has stirred controversy. A number of observers have argued that South Africa is too small in terms of economy and population to be considered an authentic member of this group. In this article, the author accepts that South Africa may have no place in the analytical construct that Jim O’Neill of Goldman Sachs invented in 2001, but also argues that South Africa is a valuable and legitimate member of the political construct that we know today as the bric(s). South Africa has the “soft power” needed to play a constructive role in the rebalancing of geopolitical power globally, and is a potential voice for the continent of Africa. However, South Africa’s position in the brics must be understood in terms of its own contested role as a leader in Africa; the ambiguous outcomes of the brics engagement with this continent; and the danger that the brics may become an exclusive self-selected grouping rather than a potent force for greater global equity. In the early 1970s the G77 and the Non Aligned Movement (NAM) challenged the material and intellectual pillars of the postwar liberal capitalist system through collective action at the UN to establish a New International Economic Order (NIEO). The aim was to complete the ‘emancipation’ of the ‘global South’ by creating binding institutional frameworks, legal regimes and redistributive mechanisms correcting historically constructed core–periphery disparities. That ambitious effort failed in the face of ‘Northern’ resistance and national segmentation within the NAM. Today re-emerging states of the global South are engaged in a more successful effort to gain voice and alter international hierarchy by claiming a central place in the world capitalist system and restructuring it from within. The vertical late-modern world system centred in the Atlantic and ordered by the ‘West’ is thus gradually giving way to a polycentric international structure in which new regional and transnational ‘South–South’ linkages are being formed. This paper critically reviews the transformation and argues that, while it is creating long sought-for conditions of relative international equality, it has also dampened the emancipatory promise of the anti-colonial struggle. South–South cooperation is assumed to reﬂect a deep attitude of solidarity among nations of the global South. We point out that, although India, Brazil and South Africa (IBSA) present themselves as being in the vanguard of South–South cooperation, their foreign economic policies make such solidarity somewhat thin. We focus on examples in which these three states deliberately but also unintentionally create sub-optimal conditions for the development of some of their Southern neighbours. This outcome reﬂects the policies that emerging centres of accumulation in the South are promoting, as well as the material interests of the dominant class alliances in the aforementioned states. There is a need for close scrutiny of the foreign economic policies of dynamic developing economies, and for closer multilateral coordination among the states of the global South. In Durban, South Africa, five heads of state meet on March 26-27 2013 at the International Convention Centre, to assure the rest of Africa that their countries’ corporations are better investors in infrastructure, mining, oil and agriculture than the traditional European and US multinationals. The Brazil-Russia-India-China-SA (Brics) summit also makes space for 16 heads of state from Africa, including notorious tyrants. A new $50 billion ‘Brics Bank’ will probably be launched. There will be more talk about monetary alternatives to the US dollar. Three narratives have emerged about Brics. The first is promotional and mainly comes from government and allied intellectuals; the second perspective is wait-and-see patience; and the third is highly critical, from forces who meet as ‘brics-from-below.’ All can be found in the following pages. The first narrative is represented through the most intellectually-engaged speech about Brics we have found by any local politician: Maite Nkoana-Mashabane, South Africa’s foreign minister. At a gathering of the 5th Brics Academic Forum on March 10, she requested robust, critical engagement, and by reading the ‘Recommendations’ of that group’s meeting at the Durban University of Technology, you can assess whether she can be satisfied. We think not. Historians will judge whether, indeed, Brics ‘have given African nations the ability to start to escape the clutches of neocolonial dependence on foreign aid, and the policies and “advice” of Western-controlled finance institutions’ – as claimed by Pretoria’s minister of higher education Blade Nzimande at the same meeting. Again from the critical end of the spectrum, Anna Ochkina of Moscow’s Institute for Globalisation and Social Movement Studies (not a think-tank by the Klein criterion) argues that there is merely a ‘spectre of alliance.’ However, Vladimir Shubin provides a vigorous counterargument. The critics note how badly divided the Brics bloc is at several crucial junctures, and indeed the one major unifying initiative in Durban aside from a Brics Bank announcement, is the highly dubious ‘Africa gateway’ grab by South Africa. As I report (in ‘From Nepad to Brics, SA’s toll at the “gateway to Africa”‘), this is not likely to end well, if the last decade’s experience is any guide. After all, as Tomaso Ferrando argues in great detail, the land grabbing underway by Brazil, India, China and South Africa is a shocking update, reminiscent of Berlin’s ‘Scramble for Africa’ conference in 1885, of colonial landgrabs. These are now replaying through Bilateral Investment Treaties and other legalistic attacks by Brics members and corporations. Victims are peasants and others reliant on land, water and related resources, as well as food consumers, as Obang Metho from Ethiopia testifies. Moreover, if the strength of commitment to Africa’s basic survival is measured in part by the way the Brics have helped to cook the climate – given an anticipated 200 million unnecessary African deaths this century due to floods, storms, droughts, famines and vastly increased disease burdens (carried especially by women) – then the gateway metaphor transforms into a rather hellish entryway, as I argue in another article. Friends of the Earth International illustrates the corporate connections with a case study of Vale, followed by Bobby Peek considering winners and losers from Brics’ Mozambique investments. The Brics Bank is another site of contestation, and Carlos Tautz provides a warning of dangerous financing from above, while Susanne Soederburg reviews crises caused by predatory lending against those below. It doesn’t have to be this way, according to University of California sociologist Chris Chase- Dunn, who believes Brics are not necessarily ‘sub-imperialist’; nor Sam Moyo and Paris Yeros who call for a revivial of Non-Aligned strategies; nor University of Delhi political scientist Achin Vanaik. They see trajectories from the Brics semiperiphery that can move in counterhegemonic directions, though Vanaik leans across the fenceline into Brics-sceptic territory. Another more mainstream voice who is doubtful that the Brics can overcome their ‘useful idiot’ role is the prolific Sao Paulo geopolitical commentator Oliver Stuenkel. 'Maldevelopment' based on elite-centric, consumerist, financialised, eco-destructive, climate-insensitive, nuclear-powered strategies which advance corporate and parastatal profits, but which create multiple crises within all the Brics (as witnessed during the Marikana Massacre carried out by police on behalf of Lonmin platinum corporation last August, and in South Durban where R225 billion ($25 bn) in white-elephant state infrastructure subsidies for chaotic port, freight and petrochemical industry expansion – and more labour-broking exploitation – are being vigorously resisted by victim communities). Confusingly to some, Brics regimes carry out this agenda at the same time they offered radical, even occasionally ‘anti-imperialist’ rhetoric, accompanied by mainly trivial diplomatic actions. Yet the Brics alliance is incoherent, as shown in the elites’ debilitating disagreement over who would lead the IMF and World Bank in 2011-12. In the UN Security Council, Brics countries seek greater power for themselves, not the collective: repeated bids for permanent membership by India, Brazil and South Africa are opposed by Russia and China. And recall the humiliation when Beijing told Pretoria’s Home Affairs Minister (now African Union chairperson) Nkozasana Dlamini-Zuma not to grant a visa to the Dalai Lama to attend Archbishop Tutu’s 80th birthday party in 2011, or attend a 2009 Tibet solidarity gathering. We seem to have lost foreign policy autonomy to Chinese whims. ‘Resource Curse’ maldevelopment often follows such infrastructure. This is also true, geopolitically, when it comes to facilitating Brics investments. In January 2013, for example, Pretoria deployed 400 troops to the Central African Republic during a coup attempt because ‘We have assets there that need protection,’ according to deputy foreign minister Ebrahim Ebrahim. Allegations by a former South African official are that these mineral interests include uranium arranged via corrupt heads-of-state collaboration, and has Ebrahim confirmed that Pretoria sent sophisticated arms to the brutal regime of François Bozizé. votes (for dollars rule at the IMF), while Africa actually lost a substantial fraction of its share. For these reasons, will Durban 2013 be known as the logical successor to Africa’s initial carve-up: Berlin 1885? Building a bottom-up civil society network to analyse, watchdog and represent silenced voices of dissent has never been more important. One part of this process involves an analysis of the pros and cons of Brics. We hope you the reader can join the conversation because from Africa, too little has been said about Brics, given what is at stake. S Kimenyi, Mwangi & Zenia, Lewis (2011) The BRICS and the New Scramble for Africa The Brookings Institution : 19-21. Böhm, Steffen & Ceci Misoczky, Maria & Moog, Sandra () Greening Capitalism? A Marxist Critique of Carbon Markets Organization Studies : 1-22. Bond, Patrick (2004) Bankrupt Africa: Imperialism, Sub-Imperialism and the Politics of Finance. Historical Materialism : 144-172. Bond, Patrick (2013) Bond BRICS report-back in Clairwood slides Sarah Bracking & Patrick Bond at SDCEA workshop, Clairwood, 20 April : 1-28. Bond, Patrick (2013) The BRICS Bank and Shifts in Multilateral Finance: A view from South Africa 'Rising Powers' workshop, Fudan University, Shanghai, 12 September : -. Bond, Patrick (2013) How are the BRICS responding to the capitalist crisis? Breaking the chains - or polishing the chains? Centre for Civil Society Seminar: Financial crises and social resistance, from household to global scales : 1-55. Bond, Patrick (2014) The BRICS “New Development Bank” Promoting equality and socioenvironmental justice in BRICS : 1-32. Bond, Patrick (2013) So where to, brics-from-below? and also, where from, in contestations of BRICS sub-imperialism? People's Dialogue BRICS strategy session : 1-78. 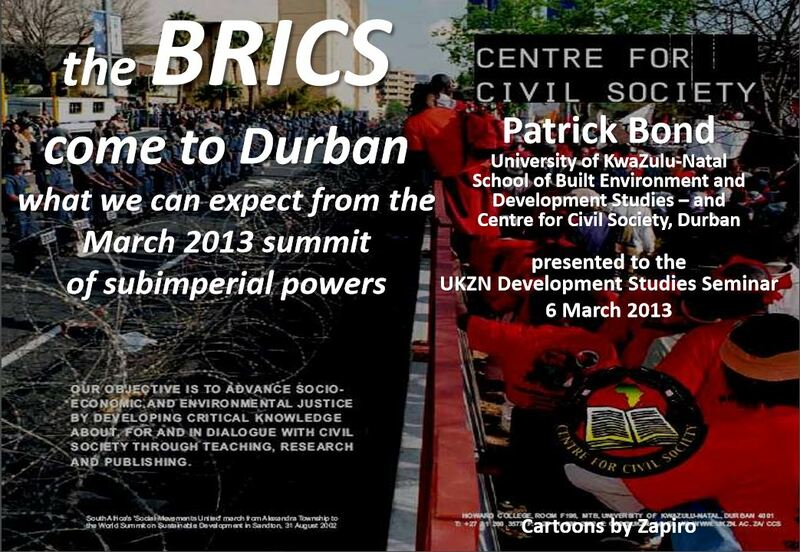 Bond, Patrick (2013) The BRICS come to Durban what we can expect from the March 2013 summit of subimperial powers UKZN Development Studies seminar : 1-92. Chase-Dunn, Christopher (2006) Contemporary Semiperipheral Development: the Regimes and the Movements Paper to be presented at the Santa Barbara Global Studies Conference session on Rising Powers: Reproduction or Transformation? February 22 – 23, 2013 : 1-19. Ferrando, Tomaso (2013) BRICS and Land Grabbing: Are South-South Relationships Any Different? : 1-32. Ghosh, Jayati (2012) India in the BRICS Presentation for workshop on “Strategies of development in India and other Asian countries: IIE, UNAM, Mexico City, 27 November 2012 : 1-14. Lysa John (2012) Engaging BRICS Challenges and Opportunities for Civil Society. Oxfam India : 1-36. Moyo, Sam & Yeros, Paris (2011) Rethinking the Theory of Primitive Accumulation: Imperialism and the New Scramble for Land and Natural Resources Paper presented to the 2nd IIPPE Conference, 20-22 May 2011, Istanbul, Turkey : 1-31. Notshulwana, Mxolisi (2012) South Africa’s national interest and BRICS: Towards bandwagoning or balancing? Development Bank of South Africa : 1-12. Panitch, Leo (2011) American Empire, Capitalist Crisis and the Global South Keynote speech to the Society for Socialist Studies : 1-10. Petras F, James (1975) New Perspectives on Imperialism and Social Classes in the Periphery Journal of Contemporary Asia : 291-308. Petras, James (2010) Anti-imperialist politics: Class formation and socio-political action Journal of Contemporary Asia : 1-22. Wade, Robert (2013) The United States and the World: The Art of Power Maintenance www.postwesternworld.com January–February: 5-39.